Ultrasonic thickness gauge uses advanced ultrasonic non-invasive technology for measuring wall thickness and checking corrosive and fault points of of metals and other material . And the ultrasonic thickness gauge is a good helping hand for ultrasonic accurate flow measurement by measuring pipe wall thickness. Sound Velocity Range: 500~9000 m/s. Materials: Any hard materials including steel, cast iron,aluminium,red copper,brass,zinc,quartz glass,etc. 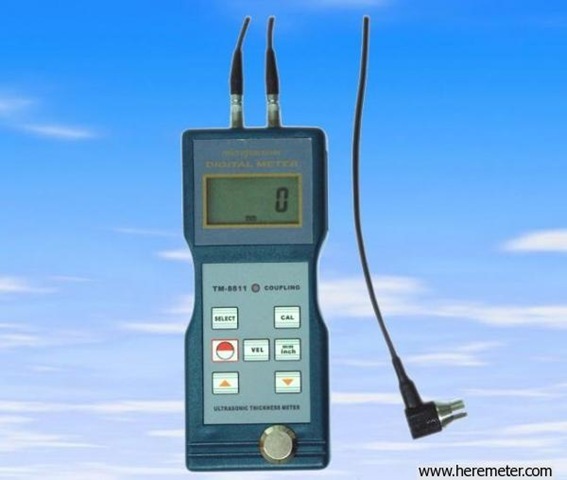 1)Thickness meter 8811 can measure any hard material and thickness meter 8810 can only measure 11 kinds of material,so thickness meter 8810 is not recommended. 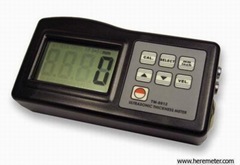 2)Thickness meter 8812 has RS232 port and software,so it can be communicated with PC. 3)The measuring range of 1-200mm is only for 45# steel. For other material,the range will depend on the detailed material hardness. For example, if PVC material, the Min value will be 20mm. 4)The serial ultrasonic thickness gauges can be used for measuring thickness of GRP (Glass Reinforced Plastic or Fiberglass). 5)The ultrasonic thickness gauges can test wall thickness of hard rubber,but can’t for soft rubber,because soft rubber will absorb too much sound wave which can’t produce valid ultrasound. How to Select Inline Ultrasonic Flowmeter?